Preparing the items for the Seder plate requires several hours of work. It is advisable to get other members of the house to help, so that the work will be completed before the Seder begins. 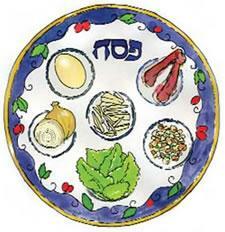 It is best to prepare all the Seder foods before the onset of the holiday, in order to avoid halachic questions. The Matzot are symbolic of the three castes of Jews: Priests, Levites, and Israelites. They also commemorate the three measures of fine flour that Abraham told Sarah to bake into matzah when they were visited by the three angels (Genesis 18:6). On a practical level, three matzot are needed so that when we break the middle matzah, we are still left with two whole ones to pronounce the Hamotzi (as required on Shabbat and holidays). The special foods we eat on Passover are also food for thought. Every item on the Seder plate abounds in meaning and allusion. Following are descriptions of each of the Seder plate foods listed above, with the reason each is included, the method of preparing it, and its role in the Seder meal.